First things first, the advent calendars. We all love a sweet treat, especially when it’s presented in a handcrafted calendar. If you’re short on time and want to create something unique and special, then see which of our quick homemade advent calendars takes your fancy. 1. Have a go at using envelopes to create pouches for sweet treats and festive messages. Simply stamp, pencil or paint the numbers onto the front of the envelopes, fill with a lovely note or some goodies and seal. 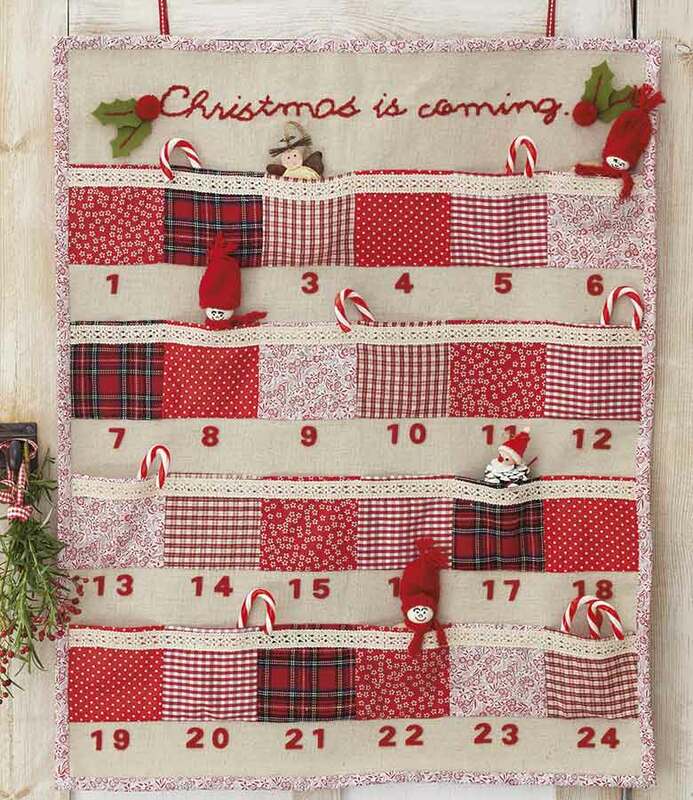 Put your own twist on our advent calendar ideas in the way you display them. Try pinning them to a noticeboard using thumbtacks in the shape of a Christmas tree or string them up to create a garland with twine and hole punches. 2. Use a combination of Canvas Drawstring Bags and pegs to fill and hang from strings. You can even add a little fabric tape to the pegs to match your decor and style. With the same technique, use simple paper bags as pouches decorated with doilies, twine and ribbon. 3. Create an advent of adventures! Instead of gifting sweet treats, you could give the lucky recipient a jar full of activity ideas. Here’s a few examples to help you get started… Watch a Christmas film, go ice skating, sing some Christmas carols, go on a family drive to see the Christmas lights, take a weekend walk through the countryside. Simply write the different adventures on pieces of card, pop in a large jar and fish one out everyday! 4. Take ordinary household items and use them as pockets. We took 24 mis-matched children’s socks and pegged them to some twisted strings. 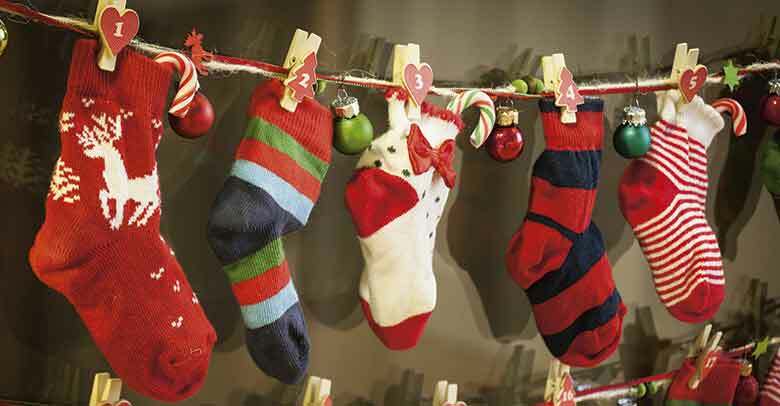 Create a really festive feel by interspersing each sock with a bright bauble. 5. Transform ordinary bunting with Christmas fabric. Simply sew around the bottom two edges of the bunting flags and leave the tops open. Add a button or popper fastening to the top to close the opening and sew a strip of bias binding along the back of the flags for hanging. 6. Go crackers for Christmas! Wrap small cardboard tubes with seasonal wrapping paper, leaving at least two inches of excess paper at the ends. Fill the tube with your treats and seal both ends with some pretty ribbon or twine. Glue on some felt numbers and string the crackers together to create a cracker wall hanging, very handy if you’re short on space! 7. 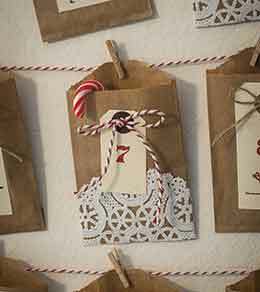 Make an advent calendar tree using decorations and Jute Bags. Find some fallen twigs, then spray with gold or silver paint. Arrange the twigs in a festive vase and decorate with some small baubles. Attach your treat-filled pouches to the branches with little pegs and you’ll have created a delightful display! 8. 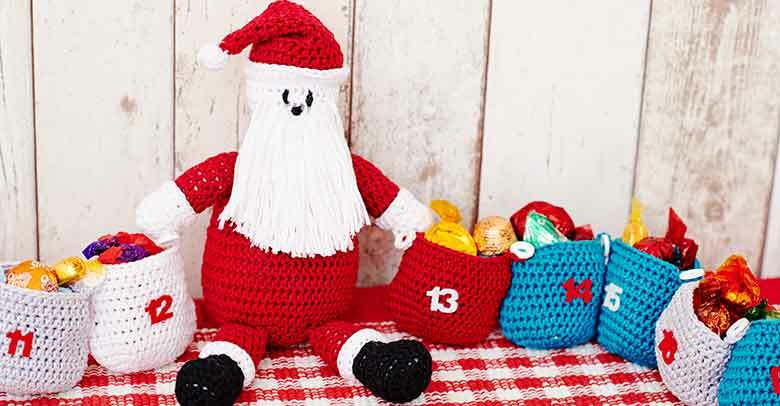 If you can crochet, then make this Father Christmas Advent Calendar! Full his multi-coloured sacks to the brim with chocolatey treats, each bag is buttoned to the next to create the garland.